A WEALTHY American art connoisseur has decided against donating his collection of 90 blue-chip Aboriginal artworks worth $10 million to an Australian museum or gallery after his attempt to add a painting to the collection was thwarted by national cultural heritage controls. Investment banker John Wilkerson, 68, said he was bruised by his failure to buy Tommy Lowry Tjapaltjarri's Two Men Dreaming at Kuluntjarranya for the collection housed in New York and frequently lent all over the world. He said Australian legislation preventing export of what was then a 23-year-old canvas was outdated, dysfunctional and ultimately damaging for indigenous art in a struggling market. "The protection act was started in 1986 and then it was tightened in 1999 but that is over a decade ago," Mr Wilkerson said. "The market has changed dramatically and the regulations in my mind need updating. One time I even considered donating the whole collection to an Australian institution but they certainly eliminated that possibility, given the challenges that I've had." 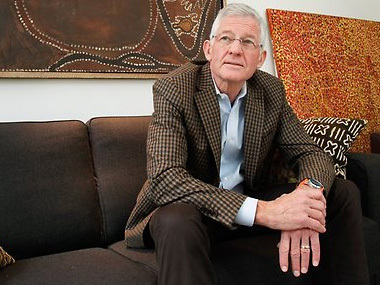 Mr Wilkerson's complaint is echoed by Sotheby's Australia, by art consultant Tim Klingender, who has been at the vanguard of the secondary art Aboriginal market for 30 years, and by other dealers contacted by The Weekend Australian. Philip Batty, a senior curator at Melbourne Museum and an occasional member of the panel charged with judging whether artworks were too precious to be removed, said it took too many months to reach a decision. Indigenous artworks worth more than $10,000 and more than 20 years old must be cleared by an expert panel before they can leave Australia permanently. By comparison, artworks by non-indigenous Australians must be worth more than $250,000 and be more than 30 years old before they require equivalent clearance. The law in regard to indigenous works is intended to prevent the loss of culturally significant artefacts and 1970s dot paintings, the "early boards". Critics of the law say it is failing because too many Aboriginal works are being caught in parameters set too tight, experts take too long to evaluate them and there's nowhere for works to go if they are refused export clearance. Mr Klingender said: "Whether or not it was the government's intention, changes to the Movable Cultural Heritage Act in the late 1990s have had a devastating effect on the collectability of indigenous art internationally and have stymied or put into reverse a market that was on a steep trajectory to become a seriously internationally collected field." Mr Wilkerson said his experience was a case in point. He paid $576,000 at Sotheby's in July 2007 for the 1.2m x 1.8m Tjapaltjarri canvas in full knowledge the work required clearance. No Australian institution bid on the work. The Tjapaltjarri was a canvas, not a board, and was painted in the 80s when commercial painting became commonplace rather than the 70s when works were rare. He had also been told Tjapaltjarri was not one of the master dot painters. For these reasons, Mr Wilkerson and his advisers were confident the work would be released. When an export permit was refused, Mr Wilkerson spent $50,000 and four years challenging the decision without success. He is now faced with the conundrum of what to do with the picture. Having bought at the top of the market in 2007, Mr Wilkerson would struggle to sell it for an equivalent price in the current faltering indigenous art market. "When the examiners designate an item to be culturally significant and so rich and rare and precious that it can't leave the country, then the government should have a plan," he said. In France, works denied export permits are automatically acquired by the state, while in Britain state institutions have a year to acquire items denied permits, after which time they are released. Mr Wilkerson and his wife, Barbara, have more than 60 paintings from central Australia and about 30 other artefacts in what is thought to be the best collection of its kind outside Australia. Twenty pictures from his collection are on loan to the National Gallery of Victoria, which displayed them in its recent popular Western Desert art show, scheduled for display in Paris this year.